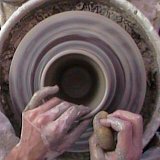 Choose the right pottery clay to buy for your clay pot projects on the pottery wheel. 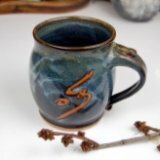 Learn Clay types and colors, red, stoneware, white. Discover how to make clay. Find ceramic clay supply in the online Pottery Supply Store. Choosing the right pottery clay can be challenging. Keep it simple. First we'll look at some definitions of clay. Then I'll share three easy questions you can ask to help determine which type of clay is right for you. What is Clay? - In technical terms clay is made up of very small particles of silicate created by the chemical weathering of rock. It is often found in lake or river beds, or in places where forces of erosion have carried and deposited it. 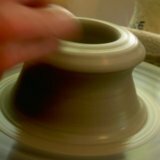 Clay For Pottery - In pottery terms, clay is a plastic (meaning able to bend and hold it's shape) combination of minerals that can be formed, and permanently hardened by firing. My Definition of Clay - For me, clay is that amazingly sticky yet slippery, solid yet mold-able mud that makes all sorts of cool pottery possible. It comes in a variety of colors from brown clay to white clay, red clay, cream clay, and speckled clay. It is soft when wet, brittle when dry, and extremely hard when fired. Here are three easy question to help you determine the right clay for your pottery project. 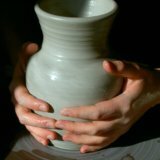 If you are new to making pottery on the wheel, here are a couple of things to look for. 1) Use a light colored clay. Red clays tend to stain clothing due to their iron content. 2) Use a smooth clay that has little or no grog in it. Grog is coarse, like sand. It has it's place in pottery. It is used in clay to make it stronger and keep it from shrinking in the kiln. However, when you are throwing for the first time, it can rub your skin like sandpaper and make it a lot less fun. At What Temperature Will You be Firing? Firing pottery is one of the most fun aspects of pottery. It is important, however, to know what temperature the clay needs to be fired to. Clay firing temperatures are measured by pyrometric cones ranging from cone 022 to 10. The three most common firing cones are 05 (low, earthenware), 5 (mid-range), and 10 (high, stoneware and porcelain). Cone 05, or low-fire is usually best for beginners. It fires more quickly. More kilns can reach cone 05, and there are more commercial glazes available that fire at this temperature. I fire at cone 5 (mid-range). It is still fairly user friendly, glazes are easy to come by, and the firing is faster than cone 10. Many potters fire in the cone 9-10 range using gas or wood kilns. This provides unique opportunities for very durable pottery with exceptional glaze results. What Project are You Creating? Your project determines the type of clay you will need. For smaller clay pot crafts to make for beginners a smooth clay of any firing temperature is good. If you want to make pottery for use with food, higher temperatures tend to be better because they are more water tight. Darker clays will tend to show through the glazes, whereas white clays don't influence the glaze as much.